It’s the tenth of August, and I can barely believe my ears. 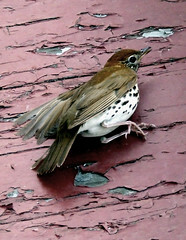 A wood thrush is singing two weeks later than I’ve ever heard one before. Such a wonderful, unexpected gift so late in the season when most birdsong has been replaced by the buzzing and chirping of crickets and grasshoppers. But then it is for the unexpected as well as the expected that I venture outside every day. Sometimes, during the heat and humidity of August days, the forest seems as empty as it is in winter. Then, through a curtain of leaves, I watch a smaller bird silently chase an immature red-tailed hawk that is still learning how to navigate in its new world. All those songs and calls are expected for August. 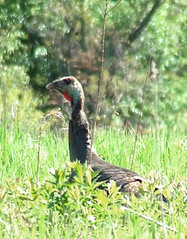 So too are encounters with wild turkeys such as one I have when early one sunny morning, near the beginning of the Far Field Road, a wild turkey flaps off from a tree branch. Then another follows. A third clucks unseen in the tree branches. When I move, she flies off, accompanied by a gawky teenager. As I continue my walk at least eleven more turkeys flush from the treetops. During the same heat wave, my husband Bruce and I are driving back from town at noon. At the bottom of our road, Bruce slams on the brakes to avoid hitting a young American woodcock. It continues bobbing its awkward way up the left hand track of the road until it reaches a horizontal road drain covered by open grating that it can’t cross, so it flies off in a flurry. We are both amazed. We have never seen a woodcock closer than a mile from there in the woods near our deer exclosure, and we’ve never seen any young woodcocks on our property even though a couple males perform their sky dance on First Field every March. We conclude that somewhere on our mountain we do have breeding woodcocks. During a pause in August’s heat and humidity, I watch what I call the march of the bucks from the top of the Laurel Ridge power line right-of-way. Through my binoculars, I see a deer crossing the top of the Sapsucker Ridge portion of the right-of-way. By the way it moves, its head held as erectly as an African woman balancing her worldly goods on her head, I know I’m looking at a buck. Then he slowly turns his head to catch the rising sun, which shines on a huge rack. As he disappears into the woods, a second buck emerges on the right-of-way. His rack is somewhat smaller than that of the first buck, but it is still impressive. After he melts into the woods, a suitable distance behind the super buck, a third buck, with an even smaller rack, ambles across the right-of-way. Such a scene proves to my satisfaction that bucks stay together when they aren’t breeding and that the one with the largest rack leads. But perhaps I am projecting my own ideas on what may have been coincidence. 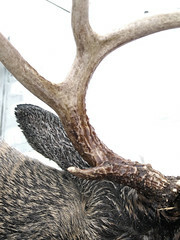 Still, Leonard Lee Rue III, in his classic The Deer of North America, writes that “In the springtime, white tail bucks are often solitary, or sometimes a big buck is followed by several younger bucks,” exactly what I witnessed except that it wasn’t in springtime, so what I saw still leaves me with questions about relationships between bucks. Mammal relationships continue to interest me when I surprise three young raccoons in our stream early one August morning. They run up the slope and climb a tree. Five days later, much farther down the stream, I hear what I think is squabbling raccoons. I sit down on Waterthrush Bench, above the stream, and wait. A few moments later, mama raccoon parades down a fallen tree trunk toward the stream, followed by her three youngsters. I remain motionless and hear another squabbling outburst, but tree leaves block my view. After waiting awhile and seeing nothing more of the little family, I continue on down the road and look back up at that tree trunk. Below it is a large tree with a hole at its base, which I assume, but don’t know for sure, is the raccoons’ den tree. I also assume that those three raccoons are the same ones I saw before and that they are ranging a fair distance in search of food. Even insects sometimes surprise me. 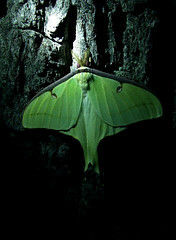 One August evening, a New Jersey visitor shows off his powerful flashlight, illuminating a spectacular, lime-green Luna moth on a black walnut tree trunk in our yard next to the walnut tree where we saw a Luna moth, freshly emerged, 364 days ago. According to David L. Wagner, in his Caterpillars of Eastern North America, the Luna moth’s caterpillar feeds on many forest tree leaves but has “decided local preferences” which include walnuts, as well as birch and black gum leaves in our area and pecan, persimmon, and sweet gum farther South. But while seeing a Luna moth is an unexpected treat, walkingsticks always appear on the side of our house or on a screen door in August, and those same New Jersey visitors are impressed when I point one out. And any August visitors spend sleepless nights in our guesthouse, kept awake by the thrum of northern true katydids, even as we are lulled to sleep by them. After years of pushing through the many orb webs of spined micrathena spiders and, indeed, expecting them in August, last August I saw only a few. Had their numbers crashed or was it an off-year for them? Sometimes, even the expected can throw me a curve ball. But the wildflowers, in August, are predictable. 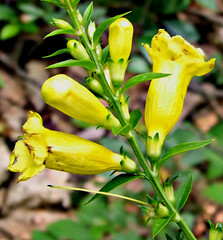 Along our forest paths, the yellow trumpets of entireleaf yellow false foxglove (Aureolaria laevigata) blossom. On the hollow road bank, white wood asters and spikenard flower. Spikenards, which only began appearing several years ago near the bottom of our road bank, have been moving steadily uphill. Last August I found three below our big pull-off, two between the big pull-off and Dogwood Knoll, and two more between the forks and our old corral — a span of well over a mile. Their greenish-white flowers, growing in drooping, compound umbels, always seem too heavy for their stems. Horse-balm and orange jewelweed or touch-me-not also grow along our road, but both are favorite deer foods. Many have been heavily grazed so I visit our three-acre exclosure for a view of shoulder-high jewelweed and waist-high horse-balm in the wetland corner of the exclosure. Late in August, I interrupt a small songbird migration over the exclosure and have a lovely view of a male black-throated green warbler and a magnolia warbler perched on a small ailanthus tree that overlooks the huge bed of jewelweed. I pause, hoping to see a foraging ruby-throated hummingbird because I know that its needle-thin bill is perfect for penetrating jewelweed flowers. 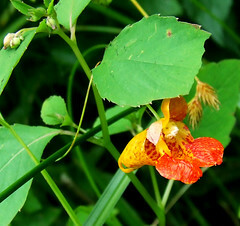 In fact, some ornithologists believe that jewelweed may have changed its floral biology to produce more nectar and encourage hummingbird pollinators. Sure enough, a female whirls in, lands close by on the fence to look me over, and then proceeds to nectar in the blossoms. Although entirely expected, it was lovely nonetheless. Three days later, I am again hanging over the fence, this time admiring the jewelweed buzzing with native bumblebees. The horse-balm too is abuzz with bumblebees. The female hummingbird flies in to nectar at the jewelweed. She also tries the horse-balm several times, but she quickly rejects it and instead deftly ferrets out every jewelweed blossom amid a sea of horse-balm. By late August, five species of goldenrod blanket our First and Far fields, and I spend hours “butterflying.” Altogether, I count nine species, including monarchs, common sulphurs, summer azures, an American copper, red-spotted purple, silver-spotted skipper, northern pearly-eye, red admiral, and dozens of cabbage whites. I’ve never been fond of cabbage whites because they are a European species that first appeared on this continent in Quebec in 1861, according to butterfly guru Robert Michael Pyle in his book Mariposa Road. 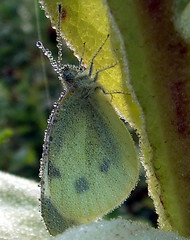 He says that the cabbage white — Pieris rapae — called the small white in England, may have arrived as pupae on a cabbage crate. Today, it is our most abundant and widespread butterfly even though some folks erroneously call it the cabbage moth because of its fluttery flight. Pyle calls it “adaptive” and “resilient,” even resisting DDT spraying in England while its predatory beetle enemies succumbed. Its preference for members of the cabbage family has earned it the enmity of farmers. The chrysalis of a cabbage white can be “buffy brown” or “green,” Pyle writes, but its color doesn’t necessarily match its background, the so-called “chameleon model.” Instead, Pyle thinks that the hypothesis “balanced polymorphism,” in which “populations adapt a ratio of green to brown expression that optimizes the chances of finding the ‘right’ substrate color in a given environment — more green in a wet setting, more brown in the desert, but some of each in either,” may be the answer. In other words, they hedge their bets. No wonder they are so successful. Pyle also refuses to call the red admiral (Vanessa atalanta) by its current name. he says that it’s a contraction of the Old English name — red admirable — and that it is not related to the true admiral butterflies in the genus Limenitis (the red-spotted purple, white admiral, and viceroy), but to the American lady (Vanessa virginiensis) and the painted lady (Vanessa cardui). I think I agree with him. The red admiral certainly looks more like the ladies, although its reddish-orange bands on its front and hind wings on a black body make it the loveliest of its congeners. As the month draws to a close, I mark the death of the huge chestnut oak tree along the Far Field Road that has harbored many wintering porcupines in its branches. Some branches now have brown, withered leaves and others are bare. Is it a victim of drought, old age, or both? Like me, it is broken down by our many years on earth and will leave its progeny to carry on the only form of immortality life on earth can hope for. The chestnut oak has finished its life span. I have not, but its death is a reminder to me to cherish in my life both the expected and the unexpected every month of the year. 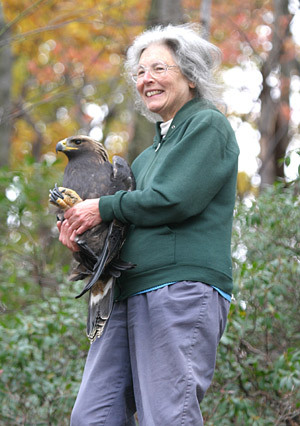 All photos by Dave Bonta, taken on Brush Mountain. Joe Pye is back. Not the Native American herbalist for whom the wildflower is named, but the gorgeous wildflower itself that towers above a sea of goldenrod in our First Field. Once we had dozens of joe-pye-weeds lifting their clusters of tiny, purple-colored blossoms above the lesser field flowers in August. Then they disappeared. We suspected deer were the culprits, and since our hunters have reduced deer numbers, joe-pye-weeds have returned. There are four species of joe-pye-weeds in Pennsylvania. 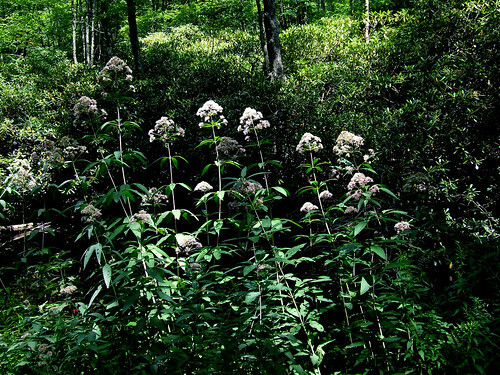 The tallest is hollow joe-pye-weed (Eupatorium fistulosum), which can grow as high as twelve feet. Also known as “trumpet-weed,” its hollow, purple stem is covered with a whitish bloom, and its blossoms are pinkish-purple. It grows commonly in meadows, moist thickets, along roadsides and in floodplains. Sweet joe-pye-weed (Eupatorium purpureum) has a solid green stem that is purple only where the leaves meet the stem, and its flowers can be pale pink or purplish. When bruised, the plant smells like vanilla. 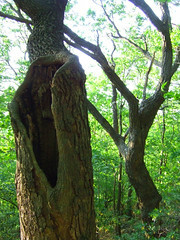 It likes drier, more shaded habitats such as open woods and fields. 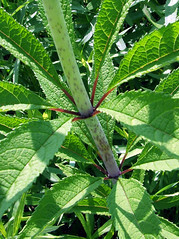 Both it and spotted joe-pye-weed (Eupatorium maculatum) grow up to eight feet tall. The stem of the latter is purple and spotted, its clusters of flowers flat-topped and purplish, and it favors wet areas—swamps, wet thickets and floodplains. Eastern joe-pye-weed is much shorter, its stem finely purple-spotted, and its flowers purple. This is the rarest of the species in Pennsylvania, preferring sandy, acidic soil in swamps, bogs, marshes and swales. All four species have leaves in whorls of three to seven on their stems. The flowers of joe-pye-weed hum with bees and are butterfly-attractants. Although the insects aid in pollinating the flowers, the plant is also self-pollinating because of its closely-packed flowers, some male and some female, the pollen-bearing stamens touching the pollen-catching stigmas. Another August-blooming Eupatorium that my husband Bruce and I found growing in a sea of Queen Anne’s lace in First Field during our evening walk was a single stalk of Eupatorium perfoliatum or boneset. It too has clusters of flowers growing atop a tall stem, but its flowers are white and its stem hairy. Its most distinctive feature is its opposite, lance-shaped leaves that clasp and surround the stem. Boneset is another native herbal and its name may have originated from its use in treating dengue or break-bone fever that once ravaged the southern United States. The fever is so painful that sufferers feel as if their bones are broken. Sipping boneset tea, made from the dried leaves, was said to relieve the pain. Another theory was that because boneset leaves were joined together, a poultice of the plant would help to knit broken bones. Or, most likely, boneset tea was a pain-reliever for those with broken bones. Boneset tea seemed to be a cure-all and was sipped to treat rheumatism, pneumonia, constipation, influenza, ringworm, and expelling tapeworms. It was even purported to cure snakebite. At least one account, by A.D. Magner in The New System 1883, seemed to justify that belief. A young woman who lived in Mahomeny Creek, Jefferson County, Pennsylvania was bitten by a rattlesnake one morning, Magner wrote. After the fruitless ride of her father to a doctor, who could do nothing, 20 miles away in Red Bank, the discouraged father was returning home when he was met by a neighbor who offered to help. The neighbor ran across his field gathering boneset, chewing some of the leaves as a poultice to put on the bite, and he planned to use the rest boiled down in milk as a drink for the afflicted woman. By the time they reached her, it was night, her tongue was swollen and hanging out of her mouth, and she was bleeding from her moth and ears. But the neighbor kept changing the poultices and giving her spoonfuls of the tea throughout the night, and by morning, she could close her mouth and had stopped bleeding. The following evening she was “entirely restored,” Magner claimed. Probably the oddest use of boneset was by the Chippewas who rubbed boneset root fibers on special whistles they made as charms for calling deer. Not all the Eupatoriums are as useful. The most notorious one is white snakeroot (E. rugosum). Even the deer don’t touch it, which is why it thrives in the edges of our fields and woods in late August and early September. Cows are not as discriminating as deer and before humans realized it poisonous properties, their cows ate it. This tainted the milk with a poison that killed thousands of eastern North American pioneers, including Abraham Lincoln’s mother Nancy. It took decades before people figured out the culprit. Native Americans, on the other hand, made a tea from its roots to help cure diarrhea, painful urination, fevers and kidney stones. They also burned it and used the smoke to revive unconscious patients. White snakeroot, also called “richweed,” has stalked, toothed, sharply-pointed, opposite leaves below three flower stalks, each of which supports clusters of fringy, white flowers that resemble the cultivated ageratum. It blooms from August until early October. Still another interesting native August wildflower that is making a comeback is turtlehead. Once it flowered abundantly in our woods beside our stream, but it too is a favorite of deer and gradually turtlehead disappeared. Then, a couple years ago, our son Steve discovered a large planting of it, hidden by the field grasses, at the base of a wet seep above our driveway. I was elated, especially when Baltimore checkerspot butterflies fluttered above the patch. These gorgeous black, orange and white butterflies lay their reddish eggs in clusters as high as 700 on turtlehead, or, less commonly, on English plantain and yellow foxglove. The eggs hatch in two weeks and the larvae construct a silken nest and feed on turtlehead leaves inside the nest. Although the larvae stop feeding in August, they over winter in their tent. The following spring the bristly, black and orange caterpillars leave the tent and wander off to feed not only on turtlehead leaves but also on those of English plantain, honeysuckle, lousewort, and viburnum. Looked at head on, the white or pinkish flowers of turtlehead resemble the head of a turtle, and its generic name Chelone is Greek for “tortoise.” Its species name glabra means “smooth” and refers to its smooth stems and leaves. 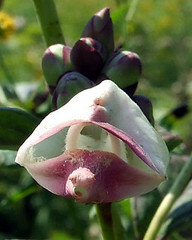 Other names for turtlehead are “turtlebloom,” “snakehead,” “codhead,” “fishmouth,” “bitterherb,” “salt-rheum,” and “balmony.” It too was a popular herbal, and Native Americans used it as a tonic, laxative, and as a treatment for worms, jaundice, and tuberculosis. One tribe, the Malecite Indians of the Canadian Maritime Provinces, employed it as a contraceptive. Herbalist Charles Harris declared it good for “the removal of toxic sludge from the stomach and intestines.” I prefer its use as a Baltimore checkerspot food plant. Orange jewelweed (Impatiens capensis) or touch-me-not grows along our mile-and-a-half long stream. 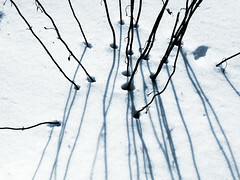 But it is a favorite deer food and is severely pruned by them as summer progresses. But inside our three-acre deer exclosure in the bottom, wet area, it reached its full height and abundance last August. Ruby-throated hummingbirds buzzed from blossom to blossom, their long bills pollinating the flowers by picking up their grains of white pollen from one flower and depositing them in another, all the while they were obtaining choice nectar. Native Americans used it as a skin salve for eczema, athlete’s foot, and especially, poison ivy rash. Our son, Dave, who is highly susceptible to poison ivy, has often rubbed the fresh leaves of jewelweed on affected areas, but apparently a better solution is to stuff any part of the plant and as much as possible into a pot of water and boil it for half an hour or more until the water turns deep orange. Bottle and refrigerate it or freeze it for longer term use and spread it on the rash. This herbal remedy works. Not all the native wildflowers of August have herbal properties. Some of my latest discoveries are merely interesting and occasionally striking such as spikenard (Aralia racemosa), which I found growing on our road bank. A member of the Ginseng family, round umbels of greenish-white flowers grow on a smooth, black stem and later clusters of dark purple fruit catch my attention when walking up our road. On that same road bank, panicled hawkweed (Hieracium paniculatum) supports a yellow, dandelion-like blossom or two on horizontal stems. Unlike the nonnative orange and yellow hawkweeds that grow in fields, panicled hawkweed is a woodland wildflower. So too is smooth false foxglove (Gerardia laevigata), which is said to be parasitic on the roots of oak trees. Its bell-shaped, golden flowers blossom on our Laurel Ridge Trail but are often nipped off by deer. Still, a few manage to bloom every August. Wood nettles (Laportea canadensis) have made a terrific comeback since our deer numbers have decreased. From none to hundreds, maybe thousands of plants, which have spread from stream bank to road bank, they have bristly stems with stinging hairs as I discovered when I first examined the unknown (to me) plant several years ago. Their branched, greenish flowers and alternate, egg-shaped leaves are their identifying characteristics. All of these native August wildflowers, in some way, reflect the white-tailed deer that roam our square mile. White snakeroot thrives because deer don’t eat it. All of the others have increased, made a comeback, or debuted because we tried and succeeded in reducing our deer herd by using skilled and dedicated hunters who take between 38 and 45 deer off our square mile of property every year. All photos by Dave Bonta. Click on them to see larger versions.